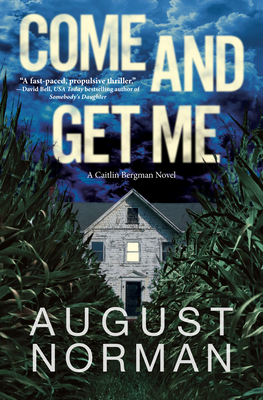 An intrepid journalist confronts a small town's dark secrets in Come and Get Me, a breakneck thriller for fans of Tess Gerritsen and Julia Keller. At Indiana University, someone's been studying the female student body: their dating customs, nocturnal activities--and how long they can survive in captivity. When award-winning journalist Caitlin Bergman is invited back to campus to receive an honorary degree, she finds an opportunity for a well-earned victory lap--and a chance to face the trauma that almost destroyed her as an undergrad. But her lap becomes an all-out race when a student begs her to probe an unsolved campus disappearance: Angela Chapman went out one Friday night and never came back. Unearthing secrets hidden beneath an idyllic Midwestern college town, Caitlin must expose what really happened to Angela--before she herself becomes the newest addition to a twisted collection. Originally from central Indiana, thriller and mystery author August Norman has called Los Angeles home for two decades, writing for and/or appearing in movies, television, stage productions, web series, and even, commercial advertising. A lover and champion of crime fiction, August is an active member of the Mystery Writers of America and the International Thriller Writers, and regularly attends the Santa Barbara Writer's Conference.